The finishing touch to a perfect landscape is a cleanly swept walkway, patio, deck and driveway. And here’s the best tool for the job! Boasting a handle of clear ash, this hand-made Canadian broom is built to sweep clean regardless of how light or heavy the job. 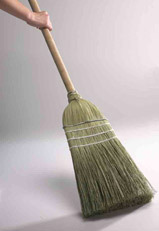 The fine fibres on the outside pick up dust particles while the heavy all-natural materials on the interior of the broom move heavy stuff without repeated ‘sweeping’. Store you new Mark’s Choice broom out of the weather and off the floor in your garage or tool shed, using the leather tether to hang it on a nail.